Designers Gouache colours are a range of opaque water colours, so called because they were developed for and continue to be mainly used by designers. Gouache is however also used by fine artists as an opaque water colour, or in combination with Professional Water Colour. Winsor & Newton Designers Gouache is accepted today as the finest quality range available, with a wide colour spectrum catering for both designers and fine artists. In addition unsurpassed covering power is achieved by the high level of pigmentation and brilliance of colour from the use of pure pigments. In use, the colours even flow produces flat washes without streaking. The colours carry the same permanence ratings as other Winsor & Newton professional quality ranges. AA and A rated colours are recommended as permanent for fine artists. 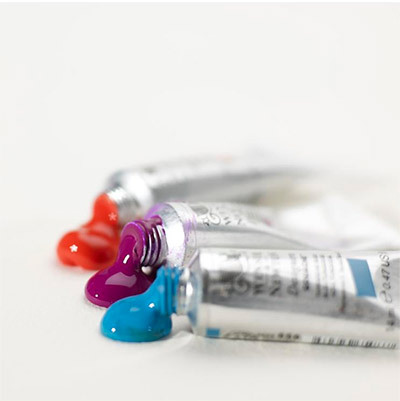 All Designers Gouache colours are fully compatible with Winsor & Newton water colour products. Colours may also be mixed with Professional Acrylic and Galeria Acrylic, however care should be taken as some gouache colours can adversely react with acrylics. The pinks and violets in Designers Gouache can have a tendency to change colour on combination with acrylic. Some other Designers Gouache colours may be sensitive to alkali and produce gelatinous or lumpy mixtures. Combinations should be tested on the palette prior to their use in painting. For fine art painting, water colour papers are recommended to exploit the widest variety of techniques and ensure long term stability. Designers tend to use illustration board or hot pressed water colour paper for a flat finish which reproduces well. The range of colours have been chosen according to mass tone (colour from tube), colour bias (undertone), colour strength and relative opacity. The range includes bright colours for designers and more lightfast ones for fine artists. The resultant colour range ensures that all artists can obtain the palette which suits their work. All colours can be safely intermixed. All colours are available in 14ml tubes. A selected number of whites and blacks are available in 37ml tubes. A selection of boxed sets are also available. Designers' Gouache has the same ratings as the other Winsor & Newton artists' quality ranges. AA and A rated colours are recommended as permanent for fine artists. Some of the brighter, Designers' Gouache colours within the range are only available as B or C rated. This is because in certain areas of the spectrum, particularly magenta, pigments are not available to achieve permanence as well as brightness and opacity. As the designer's original art work is unlikely to be required after reproduction, brightness takes priority. All the Designers' Gouache colours are more opaque than Professional Water Colours. However, the degree to which they cover does vary. The relative opacity of the colours is marked on the colour chart. When overpainting in layers, the relative 'staining' (bleeding) properties of the colours are indicated on the colour chart. Permanent White is the whitest, most opaque white. It is not recommended for mixing as it can reduce the lightfastness of some colours. Zinc White produces the cleanest and most lightfast tints and is therefore recommended for colour mixing. Bleedproof White is used by designers to prevent underlayers from bleeding through. This is a temporary solution and is not appropriate for fine art use as bleeding will occur eventually. Laser White is similar in colour and opacity to Permanent White and can be used for colour mixing. Process White is designed for use in photographic retouching, where it will reproduce its true value. Jet Black is a rich, deep, opaque black which makes blue greys when mixed with white. Lamp Black is a less opaque black of lower tinting strength, giving paler blue (cool) greys when mixed with white. Ivory Black is also less opaque with lower tinting strength and makes brown (warm) greys and sepia tones when mixed with white. Process Black is designed for use in photographic retouching where it will reproduce perfectly black.